About five years ago, McKinsey referred to the internet as the Great Transformer. This nickname described the way that this powerful technology has empowered nations, individuals, and individual businesses with access to global resources, markets, and talent. Really, one of the only obstacles to using the internet to reach across the world has been the fact that all of us don’t speak the same language. For instance, the majority of online content uses English, but only about 20 percent of the world’s population even understands this language. Here at Translite, we can remove the language barrier from the internet. You can use the website translation services that we provide to effortlessly publish your content in any languages. Learn how fast, efficient, and very affordable online content translations will expand your reach, save time, and improve your ROI. To get started, you can simply register for an account for your website. We allow you to invoke a sophisticated translation engine with the click of a mouse. After that, you can see your translated website published to its own unique URL. 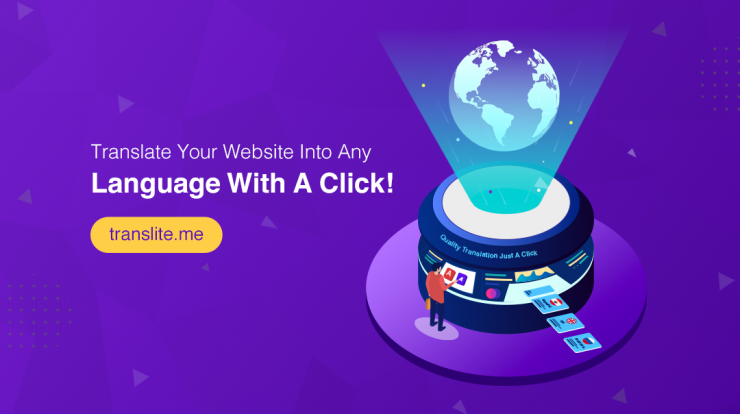 After you have initially translated your website with Translite, you can choose to automatically translate any new content you add to your site in the future. Translation doesn’t get any simpler than that, and you can even access your account from a mobile device. Edit translated content: So far, nobody has created a translation algorithm as perfect as a fluent speaker or writer. You also have access to an intuitive visual editor or a network of fluent translators to make certain that translated versions preserve the clarity and meaning of your original content. View website metrics: Your translation will automatically produce extra pages with localized content for website visitors and search engines to find. Translite also provides you with comprehensive metrics, so you can see exactly how well your new pages perform and where new visitors come from. Besides simple, automatic translations, Translite also has features that allow you to integrate translations with your own applications. You can pass strings of text through our API to receive instant translations back. In addition, we have an SDK that you can use to integrate Translite with your website, other applications, or even a new app that you create. Your business can benefit by exploring ways to communicate with global customers, workers, and other stakeholders in new and innovative ways. We offer our customers the choice of a variety of plans that will suit the needs of all kinds of businesses, schools, and other organizations. We also make changing plans as needs change seamlessly. If you’re as excited about communicating with an international audience as we are, you can also sign up for a free Translite account to start exploring this revolution in online communication right away.